Most weeks, New York Magazine writer-at-large Frank Rich speaks with contributor Alex Carp about the biggest stories in politics and culture. This week: the third GOP debate. There were ten candidates onstage in the CNBC prime-time Republican debate, not to mention the other four candidates who appeared earlier in the kiddie-table debate. Did last night winnow the field? For the past couple of weeks, we’ve been treated to a steady barrage of articles and opinion columns in virtually every major publication touting Marco Rubio as the most talented, the most likely, the most obvious survivor in this overcrowded field — the sole Establishment candidate who can survive the onslaught of the Trump-Carson crazies and walk away with the prize. The only flaw in the Rubio case is that there has been no evidence that his fellow Republicans particularly like him; as a first choice among GOP voters, his poll numbers are more or less in the 10 percent range (though, we’re assured, he’s everybody’s second choice). Last night was Rubio’s opportunity to prove his case. He grabbed more speaking time than anyone except the tenaciously tedious Carly Fiorina. And he is nothing if not slick and glib. His response to every tough question is always the same. He invokes his father, a bartender, and his mother, a hotel maid. He sanctifies himself as the living proof of the power of the American dream. The litany sounds automatic at this point, but who knows? Maybe it plays. If his rise among actual voters, as opposed to pundits and political professionals, is to come, it must start now. Particularly since the once-favored candidate among Establishment Republicans, the fallen Jeb!, had the least speaking time last night, leaving Rubio an enormous opening to poach whatever remains of his onetime mentor’s support (and donors). John Kasich, who might also have inherited some of Jeb!’s mantle as the adult Republican in the room, and who seems far more substantive and accomplished than Rubio, came across as shrill and angry in tone in the debate (even when his words were not so). So now we’ll see if Rubio’s anemic poll numbers start to rise. Meanwhile, the overall question about the GOP in 2016 remains the same. Do Republicans, especially those who vote in primaries, want a center-right candidate who has actually worked in government, or do they want a rank outsider? No matter what the pecking order, the fact is that half, or a bit more than half, of the Republican electorate still is telling pollsters that it doesn’t want a Rubio, Bush, or Kasich. It wants Ben Carson or Donald Trump or (for a while) Fiorina. I think we can say that Fiorina is done; her brief vogue ended because she is both a world-class scold and the most unconvincing populist imaginable. (She not only laid off 30,000 employees at HP but nearly destroyed the company for those who remained.) Trump is wearing thin, but even at his thinnest, he’s still outpolling most of his opponents by double digits. And Carson — the new favorite — well, he makes Trump sound like Disraeli. As the debate once again demonstrated, he babbles platitudes, generalities, and utter nonsense; lies about his own history (including as a peddler of a suspect patent medicine); and seems to regard his own ascent in politics as akin to the Second Coming. If he and Trump continue to lead the GOP field, the Republican Party has a true crack-up on its hands, with its traditional donor class and corporate infrastructure in irresolvable conflict with its radical base. It’s worth noting that the miracle man who is supposed to paper over this conflict in Washington — Paul Ryan — received scant respect from the presidential hopefuls last night. If Trump and Carson both fade, it would seem that the only acceptable alternative to the base would not be Rubio but the far-right Ted Cruz, whose debate performance was just as slick. One other point about last night: The lustiest cheers of the evening, some of them generated by Cruz, were for the candidates’ attacks on “the media” in general and the debate moderators in particular. 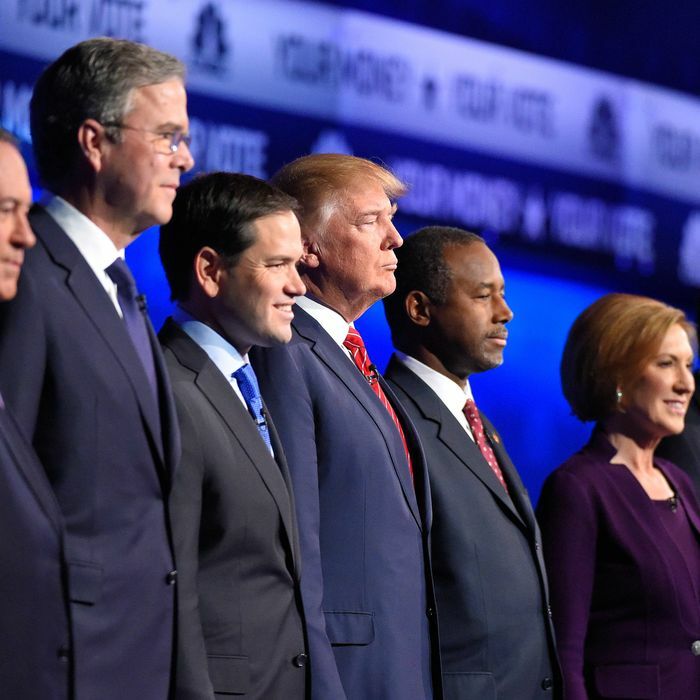 CNBC surely did everything it could to prove the candidates’ case. Without explanation, the debate was preceded by nearly 15 minutes of banter by ill-informed and bombastic commentators, including the Trump ally (and aspiring Senatorial candidate) Larry Kudlow. Among the questioners at the debate itself were Jim Cramer, a poster boy for the reckless excess and conflicts of interest that found their apotheosis in the Wall Street crash of 2008, and Rick Santelli, whose 2009 on-air rant about American “losers” inspired the tea-party movement. The whole event felt like a disorganized amateur night, and one can only imagine Roger Ailes howling with delight at every wrong turn. I would be bitter about the fact that the debate took me away from too much of Game 2 of the World Series, though, given that I am a Mets fan, maybe that was a blessing in disguise. It’s hard to see how things could get worse for Jeb Bush. He has been forced to cut campaign staff and expenses. He is relying on his brother and his parents to reassure donors. At a South Carolina town-hall meeting last weekend, he attracted criticism by complaining about the job of running for president, saying that he has “a lot of really cool things” he could do rather than suffer the indignities of trading jabs on the campaign trail. Did last night help him at all? No. Bush is finished. I’d argue that he was never a real candidate to begin with, for all the money and Establishment support he attracted. There are three basic requirements for running for president: a cause or causes you vehemently want to advance, the proverbial fire in the belly, and an enthusiastic group of grassroots supporters who want to propel you to the White House. Bush had none of the three. His campaign has been a study in incompetence that has mainly dramatized the candidate’s sense of entitlement. He was utterly blindsided by the single most obvious obstacle he was destined to face — addressing the record of his brother’s administration. As Elizabeth Drew laid out the evidence in a devastating New York Review of Books blog post last week, there were many reasons why Bush should have been prepared for the question Donald Trump raised about 9/11. The period between George W.’s inauguration in January 2001 and 9/11 was rife with national-security failures as the Al Qaeda threat grew daily. Rather than address those failures, Jeb took the position that it was impertinent to raise the question. He was similarly caught off guard by repeated questions about his brother’s instigation of war in Iraq. What’s also remarkable is how little Jeb is aware of the changes in his own party. He has seemed perpetually surprised by the heathens in the GOP’s midst. He should not have been. His own father, with his race-baiting Willie Horton campaign against Michael Dukakis, helped invite in the crazies. His brother and Karl Rove gave sotto voce encouragement to the gay-bashing forces of the religious right, and looked the other way as Sarah Palin paved the way for Trump, Carson, and Cruz. Yet Jeb still clung to a belief that the old-school patrician ethos of his parents could run to his rescue in 2016. History will look back at him, if it looks at all, as a world-class fool and the last exhausted gasp of a GOP that no longer exists.